Reus is often overlooked by travelers to the region of Catalonia. Located on the Costa Dorada, it is known for being the town with the local airport which serves tourist resorts such as Salou and Cambrils. The bustling, picturesque town is filled with outdoor cafes and a relaxed atmosphere. When you book your villa with a private pool in Costa Dorada, keep Reus in mind for a potential day trip. Reus is close to the coast, just 10 km inland and closest to the popular resort of Salou. Reus is the home town of Antoni Gaudi, the famous modernist architect from Catalonia who created some of Barcelona’s best known masterpieces. Most examples of his work are found in Barcelona; however many other architects from this area have followed suit, creating modernist works in Reus. There is a route that passes through the town that showcases the best in modernist architecture. If you are fortunate enough to visit in June, this is when the huge town fiesta takes place. Live music and parades are around every corner, and entertainers line the streets. 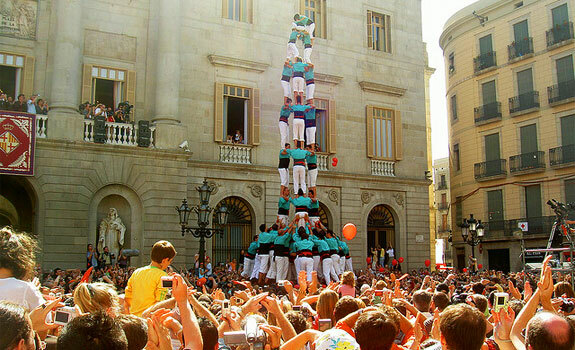 Try to catch the Catalonian tradition of castells: human towers! The bars and restaurants in the town specialize in tapas, and if you are traveling on a budget the menu of the day (menu del dia) is a very reasonable solution which includes a starter, main dish and sometimes dessert and/or coffee. Pretty parasols line the cobbled archways and streets inviting you to stay a while and soak up the town. Sit, enjoy and indulge in a tinto de verano (summer wine) which is made from red wine, lime juice and casera. It’s a refreshing drink and perfect for a summer afternoon. Fortunately, it is really easy to visit Reus even if you don’t have a car. Public transport takes approximately 30 minutes and runs from Salou, La Pineda and Cambrils. If you are holidaying in a Catalonia villa rental close by, make some time to discover Reus. Are private vacation rentals causing hotel bookings to plummet?